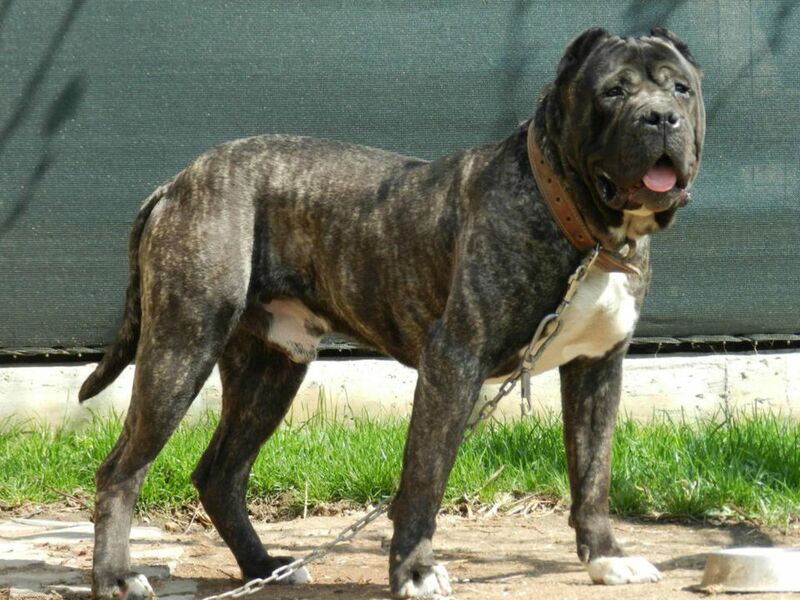 The Perro de Presa Canario is a robust, Molosser dog that was originally bred for working livestock. The name of the breed is Spanish in origin, and often shortened to "Presa Canario." When properly trained and socialized, the Presa Canario is docile, devoted, and obedient to his family—however, they are natural guard dogs and highly suspicious of strangers, and will sometimes act aggressively towards people or animals they don’t know. The Presa Canario’s stance is firm and vigilant, combined with a calm and confident temperament. With its thick and muscular rectangular body, attentive expression, and black mask, the Presa Canario is a strong-willed breed. Its broad, brachycephalic head shape usually features cropped ears, which add to its formidable expression—and also prevent damage while working with cattle. Traditionally used for herding cattle, its intimidating appearance and hyper-awareness make the Presa Canario an ideal guard dog. Also known as the “Canary Dog of Prey,” the breed is said to date back to the 15th and 16th centuries after the conquest of the Canary Islands when larger dogs would serve the very important roles of guarding farms, working cattle, and even exterminating wild or stray dogs. The roots of the Presa Canario can be traced back to the cattle breed Iberian Presa (Perro de Ganado Majorero), an average-size mastiff breed and intuitive guard dog. Several other Hispanic breeds may have contributed to the formation of the Presa Canario, in particular, the Presa Espanol, as well as the Bardino Majorero, a pre-Hispanic sheepdog originating on the Island of Fuerteventura. Over time, these island dogs evolved into differentiated breeds, and the Presa Canario became known for its intelligence, courage, and physical resistance—and its ability to exude natural guardian instincts, even without the need for excessive barking. Not surprisingly, these dogs were also often bred for dogfighting. In the 1940s, dog fighting was prohibited throughout the islands, but fights were known to continue throughout the next decade—and it was during this time that Presa Canario numbers faltered thanks to the introduction of alternate fighting breeds such as the Great Dane, Doberman Pinscher, and German Shepherd. It nearly caused the extinction of the Presa Canario, which were relegated in small numbers to farmers and herdsmen as their primary guard dog. Fortunately, in the 1970s, reputable breeders bred Presa Canarios that were both massive and courageous as well as functional, with acute watchdog instincts, a headstrong, courageous temperament, and an extremely territorial nature. Full recovery of the Presa Canario breed began in 1982 when a group of breeders from the island of Tenerife formed an association to support the resurgence of the Presa Canario. Today, the breed serves as the animal symbol of Gran Canaria. It has been recorded in the Foundation Stock Service since 1996. Due to its aggressive tendencies, the Presa Canario has been banned from several countries. The breed is allowed in the United States, but not currently recognized by the American Kennel Club. However, they are accepted by the AKC Foundation Stock Service, which provides a secure location for its records and permits the dogs to compete in AKC companion events. The Perro de Presa Canario will require occasional bathing to keep his short coat clean but may require regular grooming and brushing due to its short coat that sheds and strong, fast-growing nails that will need to be frequently trimmed with a nail clipper or grinder. The dog’s short ears should be checked on a routine basis, and teeth should be brushed regularly. This high-energy breed will crave daily exercise, including playtime outdoors or being taken for multiple walks each day. They can also learn indoor games like hide-and-seek or learning new tricks, as the Presa Canario is eager to please its owner and highly trainable—and thrives when he has a specific job to do. The Presa Canario’s robust, muscular physique and athletic prowess means it can engage in higher-intensity outdoor activities like swimming, hiking, and retrieving balls or flying discs. While protective and devoted to its family, this breed is generally better suited for experienced, active owners who can properly socialize their Presa Canario and provide ample opportunity for outdoor activity. Because of its history as a guard dog, the breed is strong-willed, powerful, intelligent, and very suspicious of strangers—and therefore may require increased opportunities for socialization and training early in life to safely interact with others, particularly in a home with children or other pets. These dogs can be calm, affectionate, and obedient, but only with the proper training from experienced owners, as they have a powerful natural instinct to attack anything that appears to be a threat. Intensive socialization and obedience training as puppies and beyond is crucial for the Presa Canario breed, and they will respond best to fair, consistent training and clear limits. Overall, the majority of Perro de Presa Canarios are healthy dogs. Due to its larger size, the Presa Canario can be susceptible to hip or joint dysplasia, and the breed has also been associated with some heart and eye problems, epilepsy, and conditions related to a weaker immune system. Canine Leishmaniasis, a disease caused by Leishmania parasites that are transmitted from the bite of an infected phlebotomine sandfly, is also known to affect dogs hailing from areas of Spain, including the Presa Canario. Whether commercially prepared or cooked at home (with guidance from a veterinarian), the Presa Canario will perform well with any high-quality dog food. As a larger, active breed, they may require more water than the average dog, and may also prefer a higher-protein diet. Although the Presa Canario is not eligible for registration with the American Kennel Club, it is possible to find a reputable breeder. The United Perro de Presa Canario Club provides referrals to breeders; the best way to find a Presa Canario rescue is to research rescue groups online. When determining if the Presa Canario is the right dog for you, be sure to research all aspects of the breed and consult other Presa Canario owners, breeders, and rescue groups to learn more. There are many dog breeds to choose from. With a little research, you can find the right one to bring home.